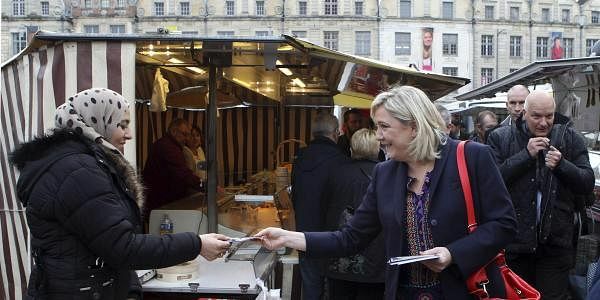 To jump from election front-runner to president, Le Pen needs legions of voters to cross the Rubicon and switch camps. LYON: Jose Evrard's left-wing credentials were impeccable. His great-uncle Victor, he recounts with pride, was a French communist executed by the Nazis; his father worked in a coal mine; Evrard himself was a card-carrying French communist for 36 years. So the former postal worker is the least likely person one would expect to see basking in adulation at a congress of France's far-right National Front. Yet there he was, in a grey suit and patterned tie, sharing the stage where party leader and presidential candidate Marine Le Pen would later reduce followers to tears vociferating against immigration and the European Union. To cries of "Bravo!" from the audience, Evrard recounted his pendulum swing — from communist organizer to star convert for the populist Le Pen. "We are no longer seen as carriers of plague," Evrard said. "At markets, our presence is welcome." To jump from election front-runner to president, Le Pen needs legions of voters to similarly cross the Rubicon and switch camps. Polls suggest her core supporters should be enough to put her top in the first-round vote on April 23. But Le Pen won't win the decisive May 7 runoff unless large numbers break with past voting habits and, like Evrard, abandon traditional, even life-long, allegiances. Converts like Evrard are valuable to the National Front because they lend weight to its argument that old-school French politics, the left-right duopoly of post-war France, is collapsing. The party plays up their example to show that it has become more acceptable to vote Le Pen since she won 18 percent of the ballot in 2012, placing third in the presidential election's first round. Looking to rally voters of all stripes, Le Pen speaks of a new landscape pitting "patriots" against "globalists" — the Paris political elite she accuses of surrendering France's power and sovereignty to European bureaucrats and opening it to culture-destroying mass immigration. "We enlist all patriots from the right or left to join us," Le Pen thundered at the congress where she launched her 144-point platform in February. "Elected officials or simple citizens, wherever you come from, whatever commitments you made, you have a place at our side." Evrard and other converts were given stage time at the two-day gathering in Lyon. Showcasing people who abandoned Le Pen's political enemies to join her serves the National Front's strategy of "detoxification," its effort to rid the party of its image as a home for racists and neo-fascists. The strategy has included Le Pen sidelining her father, Jean-Marie, to distance the party from the cantankerous ex-foreign legionnaire who founded the FN in 1972 and his repeated court convictions for minimizing Nazi atrocities. Supporters in Lyon said they now feel more comfortable showing their National Front colors. "I never dared tell my parents that I voted FN," said Mireille Dumas, a retired beautician, referring to the party by its French acronym. She said she used to avoid discussing her politics with clients for fear of losing their business. "I voted in secret," she said. "Now I'm happy to have been freed, because we can talk about it." She and her husband, Thierry, were among those who sought out Evrard for selfies and handshakes after his speech, as they might a TV celebrity. Thierry Dumas said he, too, was a card-carrying communist from 1976-1982. He switched his vote to the FN in 1988 and became a party member in 2010. If Le Pen wins in May, he said, it will be "only because (other) people will have trodden this path." Evrard said it took him 13 years to complete his journey from one political extreme to the other. Having quit the French Communist Party in 2000, he says he walked into a National Front office in 2013 and said, "I want to take part in the fight, so I have come to ask for membership." He stood as a National Front candidate and beat a communist rival in 2015 local elections. Ideologically, the gulf between far-left and far-right isn't as unbridgeable as it might outwardly seem, he argued. In the National Front, Evrard said he has rediscovered values drilled into him by his left-wing family — "notions of sovereignty, independence, the defense of the Tricolor flag and all of that" — but also faced hostility from former comrades. "It's hard when you have been a (communist) member for a long time," he said in an interview. "You feel the looks saying, 'traitor,' 'phony' and what not, because people don't accept that you can change ideas."